Hazel is a friendly patchwork hedgehog just waiting to be a part of your next quilt! The original Hazel the Hedgehog includes instructions for making quilts in three different sizes. These hedgehog blocks are made using conventional patchwork techniques. This pattern can be made using precut 1½" strips, precut 10" squares, or an assortment of fabric scraps. 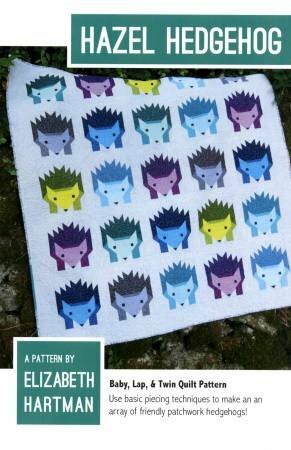 The pattern includes a summary of the pieces needed to make single blocks, so Hazel will be right at home in other quilts or smaller patchwork projects. Three Quilt Sizes: 36" x 39"